The armed conflict between the Kosovo Liberation Army (KLA) and Serbian forces started in 1992 with the KLA attacks on Serbian police officers, non-Albanians that lived in Kosovo and Albanians loyal to Serbia (Johnstone, 2002; Kozyris, 1999). This low level conflict escalated in 1996 with the KLA attacking refugee camps as well as other civilians and policemen resulting in dozens of innocent deaths (Johnstone, 2002; Kozyris, 1999). At this point of time and all up to late 1998, the KLA was regarded as a terrorist organisation (Gelbard, cited in Parenti, 2000:99; Jatras, 2002; Johnstone, 2002; Kepruner, 2003; Rubin, cited in BBC, -). Following the collapse of communism in Albania and this country falling into anarchy, many army storage facilities were ransacked and truckloads of weapons were smuggled into neighbouring Kosovo. Increased criminal activities such as drugs and people trafficking as well as compulsory taxing of Albanians working abroad also provided funding for the KLA (Antic, 1999; Jatras, 2002). Increased KLA terrorist activities were met with a harsh response by the Serbian police and army resulting in some civilian deaths and displacement. Consequent UN resolutions 1160, 1199 and 1203 as well as the Holbrook-Milosevic agreement in 1998 (Littman, 1999) demanded Serbian forces reduce in numbers and withdrawal to pre-conflict positions. Serbian government complied with most of these demands, but the demands were not met fully because of several reasons. The KLA was not disarmed and did not comply with resolutions and increased their terrorist activities. The KLA was constantly provoking Serbian forces, purposely endangering civilians (Thaci, cited in BBC, -) as they knew that “the more civilians were killed, the chances of international interventions were bigger…” (Gorani, cited in BBC, -). They also re-occupied positions Serbian forces were previously holding and at some points of time controlled up to 40 % of Kosovo territory. The KLA was re-enforced by hundreds of mercenaries and mujahideens, and started receiving support from the CIA, DIA, MI6 and German Intelligence BND (Bowman, 1999: 8; Marsden, 1999; Chossudovsky, 2001; GN TV, 2005: 1; WSWS 1999). The KLA was also supported by Osama Bin Laden and Al Qaeda (Chossudovsky, 2001; Deliso, 2001; GN TV, 2005: 1; Johnstone, 2002:11). Even though the KLA did not comply with UN resolutions and the Holbrook-Milosevic agreement, and it was responsible for most breaches of ceasefire (Robertson, cited in Chomsky, 2004: 56) there was a significant reduction in hostilities and almost all refugees returned to their places of living (Bowman, 1999; Littman, 1999). The most significant event occurred on January 15, 1999 with the alleged Racak massacre which was wrongly but consciously attributed to Serbian forces by William Walker, the head of the Kosovo Verification Mission who was previously involved in the cover up of atrocities in El Salvador (Bowman, 1999; Berliner Zeitung, cited in Free Republic, 2000; Chomsky, 2004: 56; Fleming, 1999; Gowans, 2001; Johnstone, 2002:239; Parenti, 2000:104; Wilcoxson, 2006). Allegations that Serbian forces massacred 45 innocent men, women and children were dismissed by Serbian, Belarus and Finnish forensic experts who found that these people have not been massacred or killed from close range as well as that most of them had traces of gunpowder residue on their hands, confirming that they actually were KLA fighters. The reports also state there was only one woman and one adolescent boy among the dead as well as that only one person was possibly but not explicitly shot from a close range (Berliner Zeitung, cited in Free Republic, 2000; Fleming, 1999; Johnstone, 2002). Even though this was a crucial document, the report was not made public immediately (Berliner Zeitung, cited in Free Republic, 2000; Johnson, 2002). 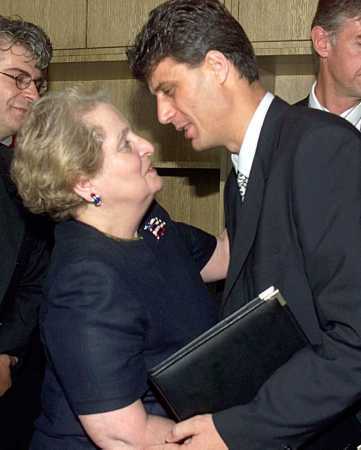 This was followed by Rambouillet negotiations, which was actually an ultimatum, that the Yugoslav government, or any other government, could not accept (Bennis, 2004: 240-241; Fraser, cited in SBS, 2000; Johnson, 2002: 245-247; Littman, 1999; Miller, 2003: 243; Muller, 1999; Parenti, 2000: 108-114; Pugh, 2001; Trifkovic, 1999). After this the Kosovo Verification Mission was withdrawn and NATO humanitarian intervention or rather aggression began and lasted 78 days. The Kosovo War was a just war because it was undertaken to avoid likely instance of “ethnic cleansing” undertaken by the Serb leadership of former Yugoslavia… It was a just war despite being illegally undertaken without authorization by the United Nations, and despite being waged in a manner that unduly caused Kosovar and Serbian civilian casualties while minimizing the risk of death or injury on the NATO side. The  bombing war violates and shreds the basic provisions of the United Nations Charter and other conventions and treaties; the attack on Yugoslavia constitutes the most brazen international aggression since the Nazis attacked Poland to prevent “Polish atrocities” against Germans. The United States has discarded pretensions to international legality and decency, and embarked on a course of raw imperialism run amok. The NATO intervention was illegal as NATO action was unilateral, avoided Security Council and therefore it was in violation of several provisions of the UN Charter, specifically Article 2 (3), Article 2 (4) and Article 53 as well as it breached NATO Charter First Article (Bisset, 2002). The Rambouillet negotiations also breached Vienna Convention on the Law of Treaties (1969) Section 2: Invalidity of Treaties Article 51 and Article 51 (Hatchett, 1999). 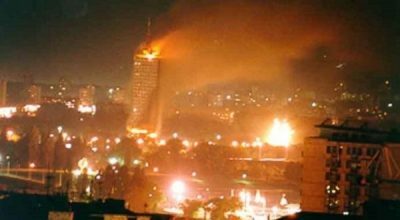 NATO also breached the Geneva Convention trying to assassinate President Milosevic by bombing his private residence (Guardian, 1999; Malic, 2003) as well as bombing the Chinese embassy. The Rambouillet text, which called on Serbia to admit NATO troops throughout Yugoslavia, was a provocation, an excuse to start bombing. Rambouillet is not a document that an angelic Serb could have accepted. It was a terrible diplomatic document that should never have been presented in that form. 22 January and 22 March 1999, passed on by NATO to the UN, show that in this period the total fatalities were 27 for the Serbs and 30 for the Kosovo Albanians. Another estimate puts the total Albanian fatalities over five months from 16 October 1998 to 20 March 1999) at 46; an average of 2 a week. By contrast, in 11 weeks of the NATO war from 25 March 1999 to 10 June 1999 NATO killed 1500 civilians and wounded 8000. This is an average of 136 deaths a week and 30 times as many deaths as the total prior to the war. I think what NATO did by bombing Serbia actually precipitated the exodus of the Kosovo Albanians into Macedonia and Montenegro. I think the bombing did cause the ethnic cleansing… NATO’s action in Kosovo was mistaken… what we did made things much worse. Also, there were reports that Serbian forces had plans to clear entire Kosovo of Albanian population by engaging in ‘Operation Horseshoe’ which later proved to be German Intelligence propaganda (Littman, 2004; WSWS, 1999). Other allegations of mass murder of Kosovo Albanians include the US State Department Ambassador Scheffer’s claims (cited in Parenti, 2000) that up to 225,000 Kosovo Albanians aged 14 to 59 were not unaccounted as well as British Foreign Office Minister Hoon claim that in more than 100 massacres more than 10,000 people were killed by Serbian forces. Also, there were allegations that Serbian forces used Trepca mineshafts to dispose bodies of killed Albanians as well burning Albanian bodies in furnaces. Finally, the human, economic and environmental costs of NATO aggression were enormous. The total estimate of human losses in FR Yugoslavia, excluding Kosovo, is 2500 with 557 civilians killed and 12,500 wounded (Dedeic, 2007). The total economic costs include £2.5bn direct NATO costs (BBC, 1999) and somewhere between $30 billion and $100 billion costs to Yugoslav devastated economy and infrastructure (Dedeic, 2007). Environmental costs are not possible to estimate. For instance, NATO planes deliberately targeted chemical complexes in Pancevo causing approximately 100,000 tonnes of highly toxic and cancerogenic chemicals and 8 tonnes of mercury contaminating the air, soil, underground waters as well as the largest river Danube (Djuric, 2005). In Novi Sad, NATO destroyed 150 oil tanks causing more than 120,000 tonnes of oil derivates burning for days and spilling into underground waters and Danube. In Kragujevac and Bor NATO destroyed electricity sub-stations causing more than 50 tonnes of highly toxic dioxin contaminate large areas (Djuric, 2005). In Kosovo and Southern Serbia several areas were repeatedly bombarded with ammunitions containing depleted uranium. Some estimates suggest that more than 10 tonnes of depleted uranium was dumped onto Yugoslavia. Srbljak reported in early 2005 (cited in Djuric, 2005:4) that the rate of people suffering from cancers of lung, bones, liver and other organs were in some parts of Kosovo up 120 times higher than in the same period in 2004. Overall, NATO ‘humanitarian’ intervention was not at all about humanitarian issues. This was an illegal aggression and an undeclared war against sovereign state of Yugoslavia and violation of the UN Charter and Geneva Convention. NATO intervention caused much greater suffering of all civilians, it devastated environment of Yugoslavia and surrounding countries as well as Yugoslav economy and infrastructure. It also increased antagonism between Kosovo Albanians and Serbs and other non-Albanians minimising chances of coexistence. This was proved by the exodus of 250,000 refugees after NATO occupied Kosovo and Albanian refugees and the KLA returned to Kosovo. It also caused radical Muslim ideas spreading into other parts of former Yugoslavia and further destabilising Sandzak, Southern Serbia and Macedonia. Russia also became concerned with NATO’s action and it increased their military spending thus re-starting arm race. The actual reasons for NATO aggression are hard to establish. Many authors believe that this intervention was about establishing a new role and the credibility of NATO in the post-Cold War era. Others see this as the result of US imperialism and hegemony as well as economic expansion as Fleming (1999) states “one way to open the market is to concur it”. Some authors also believe that this is a part of the US strategic expansionism towards the East, which involved decade’s long fight against communism and attempts to minimise Russian influence in the world. Yugoslavia was the only country in Europe that was at the time still under communist rule and therefore under Russian influence. There are certainly those who genuinely believe that NATO intervention was done because of a just cause, thus attempting to prevent humanitarian catastrophe in the middle of Europe. However, their understanding of the whole situation was distorted by the KLA/NATO sophisticated propaganda, media frenzy and the lack of full understanding of the situation on the ground. Bennis, P. 2004. Calling the shots: How Washington dominates today’s UN. Arriss Books, Gloucestershire. Chomsky, N. 2004. Hegemony or survival: America’s quest for global dominance. Allen & Unwin, Crows Nest, NSW. Chomsky, 2006. Failed states: The abuse of power and the assault on democracy. Allen & Unwin, Crows Nest, NSW. Coady, C.A.J. 2003. War for humanity: a critique. In Ethics and foreign intervention. Eds. D.K. Chatterjee & D.E. Scheid, Cambridge University Press, pp. 274-295. Durch, J. W. 1997. Introduction to anarchy: Humanitarian intervention and “State building” in Somalia. In UN: Peacekeeping, American policy and the uncivil wars of the 1990s, ed. William J. Durch. MacMillan Press, London, pp. 311-365. Fleming, T. 1999. Serbian Studies Foundation Forum – Macquarie University. Personal encounter on 09.05.1999. Hapmson, F.O. 1997. ‘The Pursuit of human rights: The United Nations in El Salvador’. In UN: Peacekeeping, American policy and the uncivil wars of the 1990s, ed. William J. Durch. MacMillan Press, London, pp. 68-102. Johnstone, D. 2002. Fool’s crusade: Yugoslavia, NATO and Western delusions. Monthly Review Press, New York. Krasno, J.E. & Sutterlin, J.S. 2003. The United Nations and Iraq: Defanging the viper. Praeger Publishers, Connecticut. Miller, R.W. 2003. ‘Respectable oppressors, hypocritical liberators: morality, intervention, and reality’. In Ethics and foreign intervention. Eds. D.K. Chatterjee & D.E. Scheid, Cambridge University Press, pp. 215-250. Mitchell, A. Serbian Studies Foundation Forum – Macquarie University. Personal encounter on 09.05.1999. Muller, R.F. 1999. Serbian Studies Foundation Forum – Macquarie University. Personal encounter on 09.05.1999. Neier, A. ‘The quest for justice’, The New York Review of Books (8 March 2001), pp. 31-35. Parenti, M. 2000. To kill a nation: The attack on Yugoslavia. Verso, London. SBS. 2000. Exact tittle of the TV documentary unknown (Malcolm Fraser on CARE Australia involvement in former Yugoslavia). Stephen, C. 2004. Judgement day: The trial of Slobodan Milosevic. Atlantic Books, London. Trifkovic, S. 1999. Serbian Studies Foundation Forum – Macquarie University. Personal encounter on 09.05.1999. Urquhart, B. ‘In the name of humanity’. The New York Review of Books (27 April 2000). pp. 19-22. Urquhart, B. ‘Shameful neglect’. The New York Review of Books (25 April 2002). pp. 11-14. Wheeler, N.J. & Bellamy, A. J. 2005. Chapter 15 ‘Humanitarian intervention in world politics’. In The Globalization of World Politics: An Introduction to International Relations, 3rd ed. Eds. J. Baylis and S. Smiths. Oxford University Press, Oxford, pp. 556-578. Young, I.M. 2003. Violence against power: critical thoughts on military intervention. In Ethics and foreign intervention. Eds. D.K. Chatterjee & D.E. Scheid, Cambridge University Press, pp. 251-273.